Six Duets For Two Clarinets, Volume I (Nos. 1-3) (Nos. 1-3). Composed by Wolfgang Amadeus Mozart (1756-1791). For Bb clarinet duet. 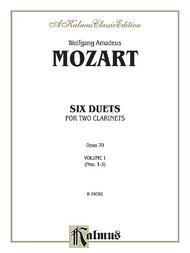 Duet or Duo; Masterworks; Woodwind - Clarinet Duet. Kalmus Edition. Classical Period. Difficulty: medium. Set of performance parts (includes separate pull-out clarinet parts). Opus 70. 26 pages. Published by Kalmus Classic Edition (AP.K04092).ISBN 076928339X. Classical Period. 8.5x11 inches.